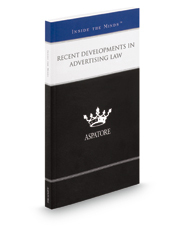 Recent Developments in Advertising Law provides an authoritative, insider's perspective on the emerging forms of advertising and how, despite the continued governance by traditional intellectual property concepts, they have led to different issues that impact practitioners and their clients. Partners from some of the nation's leading law firms guide the reader through the continuing development of new technologies, new media, and social platforms such as Facebook, Twitter, and Pinterest. These advertising law experts review and discuss the various laws, regulations, and guidelines that apply to their clients' promotion efforts and describe the importance of understanding their clients' overall strategy to ensure compliance and mitigate the risk of legal exposure. In this rapidly changing environment, these industry leaders reflect on the challenges clients face, the remedies available to them through the courts and the National Advertising Division (NAD) of the Better Business Bureau, and the role that lawyers will continue to play in this fast-paced practice area. The different niches represented and the breadth of perspectives presented enable readers to get inside some of the great legal minds of today, as these experienced lawyers offer up their thoughts on the keys to success in this rapidly changing field.